Foreign Minister Bruno Rodríguez Parrilla of Cuba addresses the General Assembly which renewed its call for an end to the US embargo against Cuba. 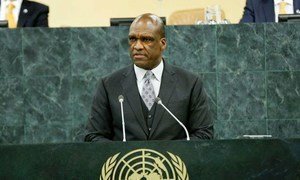 For the 22nd consecutive year at the United Nations, the General Assembly today adopted a resolution calling for an end to the economic, commercial and financial blockade imposed by the United States against Cuba. By a vote of 188 in favour to two against (Israel and the United States) with three abstentions (Marshall Islands, the Federated States of Micronesia and Palau), the Assembly reiterated its call to all States to refrain from promulgating and applying laws and measures not conforming with their obligations to reaffirm freedom of trade and navigation. As he opened the annual United Nations forum for world leaders today, the President of the General Assembly appealed to them to renew their commitment to work together to eradicate poverty and foster economic and social prosperity for people across the world through a new development agenda.